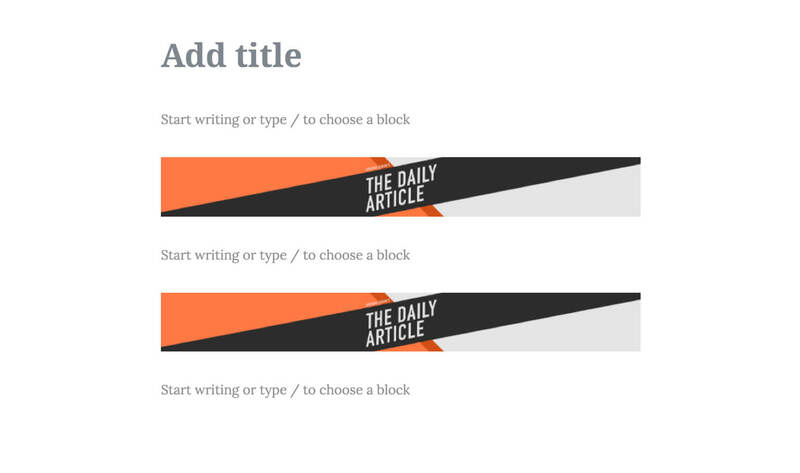 Block templates are one of my favorite new features in Gutenberg. You can specify a list of blocks that automatically appear in the content editor, and you can customize what appears in each block by default. You can also lock the template so no additional blocks can be added. This is a great replacement for metaboxes in many cases. You can control the content structure without sacrificing the visual editing experience. Block templates are currently set for an entire post type, but you will soon have more granular control to define them in page templates and other contexts. I first build the page in the Gutenberg block editor. Then I add the code below to the theme, which prints out an escaped version of post_content. This shows me the blocks and parameters I need to build the block template. I’m using ea_pp() below (code here) but you could also use print_r(). Automatic insertion after X paragraphs. It’s simple to maintain but the ads often don’t follow the natural breaks in article. Manual insertion using a shortcode. The content editor can ensure the ads work well with the content, but it’s more difficult to manage and easy to forget. With Gutenberg, we simply pre-populate the content area with two ad blocks (built with Advanced Custom Fields) and three paragraph blocks. Content editors can then dive right into content creation around the ad units. We feature testimonials throughout the website, and we have a Testimonial post type for managing them. In the past we would have disabled the editor and added a custom metabox on this post type to collect just the quote and byline. With Gutenberg, we can limit the editor to just the “Quote” block. 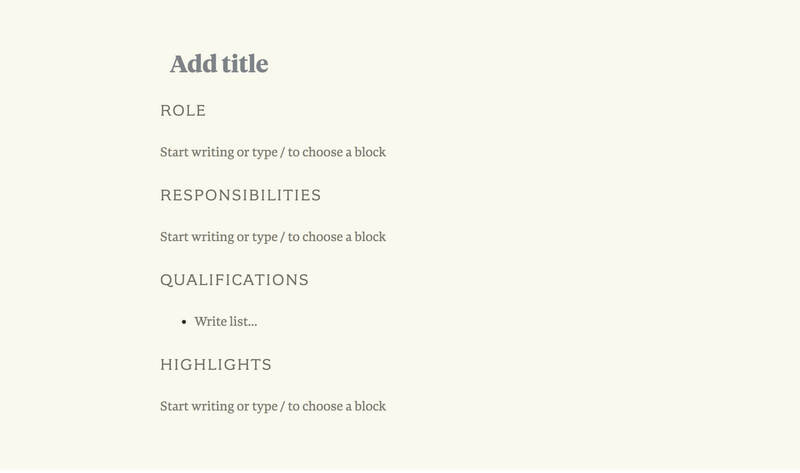 This allows the client to use the same UI for managing their blockquotes site-wide. When registering your post type, use the template parameter to specify an array of which blocks should appear. Including 'template_lock' => 'all' will prevent any changes to the layout. If you set 'template_lock' => 'insert' it will prevent new blocks from being inserted but still allow the writer re-arrange the existing blocks. We’ll be featuring these quotes using the “Large” quote style in the theme, so I’ve added is-style-large to the block attributes. I don’t like parsing HTML for this data, but it works given the simple content structure. For more advanced layouts I recommend using something like Gutenberg Object Plugin to save the Gutenberg data as an array in the database so you can access it easier. You can create nested block templates using container blocks. For instance, here’s an example from the Templates section of the Gutenberg Handbook. So metas and their uses/compatibility are eliminated from new WordPress 5.0? Metaboxes work exactly the same in WordPress 5.0 as they do in previous versions of WordPress. They will continue to play a role in WordPress for the foreseeable future. If you were using metaboxes for content creation because the Classic Editor lacked the features you need, you might be able to now accomplish those goals using the Block Editor instead of building custom metaboxes. So now we can build custom blocks instead of custom meta boxes? Right? Thanks a bunch fro your Gutenberg posts! 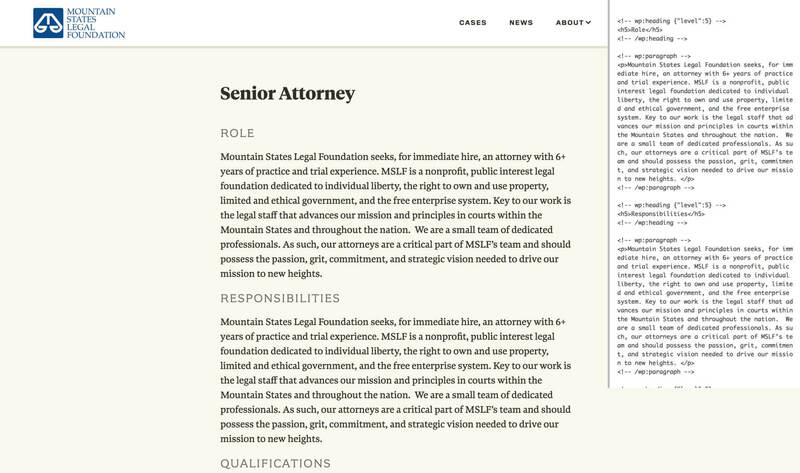 I was wondering if you already know a method to implement block templates on a custom page template level. I can’t find anything documentation on it yet. Maybe you had more luck! Unfortunately Gutenberg doesn’t support that yet, but you can follow this ticket to stay up-to-date on the issue. Someone wrote a plugin, WP Gutenberg Templates, to implement this functionality until it’s supported by Gutenberg core. I haven’t tried it yet but it looks interesting. Thank you for all the info you’ve been sharing about Gutenberg and theme development. That first little function on this page is worth it’s weight in gold! Thank you! I am building a custom Gutenberg theme and wanted to create some custom blocks for it? is it possible to create custom block inside theme instead of creating a plugin? if yes may I please know how to do that? Here’s an article I wrote on building custom blocks using ACF. Actually the theme I am going to build will be distributed and used by many clients. So I am trying to find a way to build few custom blocks inside a theme. Ideally I don’t want to create a separate plugin to add few custom blocks to the theme. If I use ACF plugin do build custom blocks, will the theme and custom blocks work without the need to install ACF plugin on client sites? I am trying to figure this out from last few days but not able to find any answers till now. So I would greatly appreciate your help here. I do not recommend packaging a custom block into a theme. When the user changes themes down the line they’ll lose access to that block and to the content created with it. All functionality a user expects to keep after changing themes (custom post types, metaboxes, custom blocks…) belongs in either a single core functionality plugin or multiple feature-specific plugins (ex: a plugin for each block). You can use TGM Activation or other tools to automatically install your plugin when the theme is activated. Once again thanks for the help!!! What is the difference between block templates and reusable blocks? Is the only difference between those two constructs about whether it is tied to a specific post type or not? Block templates are like a starting point in content creation. It’s an initial arrangement of editable blocks. Reusable blocks are blocks with specific content in them already that you can reuse on multiple pages. If you edit the reusable block, it will change the content on every page that uses that reusable block. I’m using reusable blocks on Display Posts for a “PHP Warning” (example) and “CSS Warning” (example). Any time I insert a block of PHP code I type /PHP Warning and insert the same warning used on all other tutorials. If I decide to change that text, I can edit it once and it will update all the other tutorials that use it. Thank you for the detailed and insightful reply! Thanks a lot for your post. It is very helpful and interesting. I am trying to add some predefined blocks to my page, but i can’t get your method straight. Is there any chance that you could explain in which file to add which code? You can include it in functions.php, a core functionality plugin, or the Code Snippets plugin. Basically you can place it anywhere that loads before the init hook fires since this code runs on init. I can’t a find a proper official guide about the template array string structure like the one above for a custom block ( e.g. array( ‘acf/ad’ ) ). to define a template but it doesn’t work and I think because it’s the wrong string I use (and the example uses of course). So I wonder if you know something specific about the structure that can I use? Thanks in advance and for sharing this helpful post with all of us. You use the block name, which is the first parameter of registerBlockType() when the block type was registered. Here’s a tutorial on Writing your first block type. If you wanted to include that block in your block template, you would use: gutenberg-boilerplate-es5/hello-world-step-01. As mentioned above in the quick tip, I’ve found it simpler to look at what’s in the $post->post_content field to get the name, rather than digging through plugin files to see what name they used when registering the block type. Do I understand correctly that block templates are only loaded for the initial ‘create new post’ action, and once posted, will not respond to changes in the template function even with lock-all? I mean I tested it and this is the case but I was wondering if there is a way to make it where the blocks can be moved while maintaining their content in existing posts. Correct, templates are a starting point for new content creation. They don’t affect existing content. Hi Bill. I am wondering if you have tried putting a reusable block into a template for a custom post? I have tried this and while it appears to work fine and I can publish the post, when I edit, I receive the message “Block has been deleted or is unavailable.” This means I must remove and re-add the block. Just as an aside, if I edit and save the reusable block, it will work correctly. No, I have not tried using reusable blocks in a template. It seems potentially unstable since the reusable blocks are created/managed in the database and could be removed at any time.